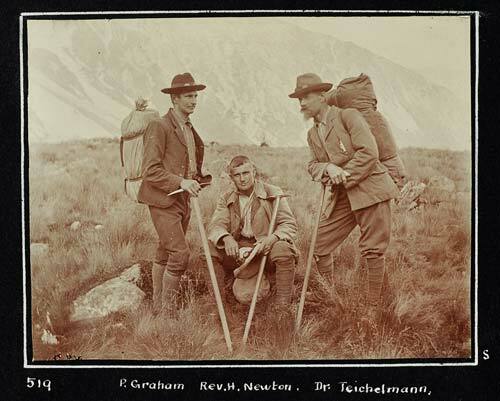 Alex Graham (left, mislabelled as P. Graham) was a professional guide, Henry Newton (centre) was the vicar at Ross, and Ebenezer Teichelmann was a Hokitika doctor. The three climbed together extensively in the Southern Alps from the West Coast side in the first decade of the 20th century. This photograph, from the album of Teichelmann, shows the trio relaxing at the Hermitage after completing the first crossing of the Harper Saddle in February 1905.